Soon after opening his furniture company in 1933 in a storefront location in Cody, Molesworth received his first big break when his furniture caught the eye of Philadelphia Enquirer publisher Moses Annenberg. The affluent, influential Easterner was on a mission to furnish Ranch A, a 700-acre complex in eastern Wyoming – now listed on the National Register of Historic Places and designated a U.S. Historic District. Molesworth was commissioned to create nearly 250 pieces of furniture for the log lodge. His designs were quickly noticed, and commissions for the Shoshone Furniture Company took off. 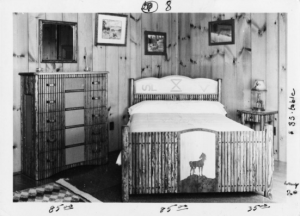 This snapshot from the Buffalo Bill Center of the West’s McCracken Research Library shows a bedroom circa 1950 furnished with Molesworth furniture for sale. Price tag for the table was $35 and the bedframe was $85. Molesworth and his talented staff were soon creating functional furniture for other wealthy home-, ranch- and lodge-owners. 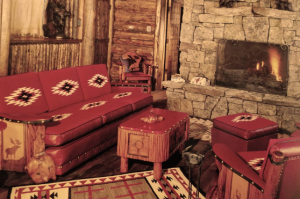 The highly recognizable furniture could be found in the West’s great lodges, such as the Plains Hotel in Cheyenne, Wyo., Pahaska Tepee Ski Lodge, TE Lodge in Cody. Molesworth even created pieces for President Dwight D. Eisenhower’s Gettysburg, Pa. house, Wyoming governor Milward Simpson’s governor’s mansion and the Rockefeller ranch in Jackson. The style was popular for decades, and many other artists and furniture makers began creating their own versions of Western style furniture, sometimes creating competitive bad blood between artisans. Even with increasing competition, Thomas Molesworth’s authentic creations remained at the top of the pyramid until he retired and closed the doors of the Shoshone Furniture Company in 1958. Like so many other design styles, the popularity of Western style eventually faded while post WWII architectural trends took off, such as the modernist Mission 66 style that was popularized in national parks and other government buildings in the 1960s. It was the Buffalo Bill Center of the West that returned to the spotlight the name Thomas Molesworth and the style he created. A 1989 traveling exhibition called “Interior West: The Craft and Style of Thomas Molesworth resulted in some well-placed stories in The New York Times and other prominent newspapers and journals and reignited enthusiasm for the style. That enthusiasm is here to stay, and collectors are always on the lookout for Molesworth pieces. If you’re drawn to the style like I am, you might want to start saving your pennies. A pair of rustic table lamps that I found on one of the auction sites is priced at $4,500, and a leather chair created in the 1930s is nearly $6,000. 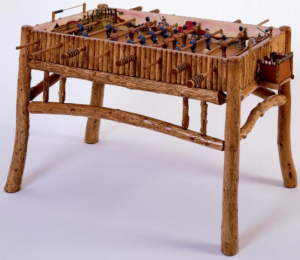 Molesworth inspired generations of functional furniture-makers who adapted the style to their own designs, such as this foosball table. Although I may never be able to acquire a Molesworth piece for my own home, I will soon be able to view the work of this furniture-making magician at the new By Western Hands Museum & Archives. Opening this summer in downtown Cody, By Western Hands will celebrate the Western decorative arts with a variety of exhibits and educational programs. Permanent exhibitions will showcase the work of Molesworth and the many designers – many still based in Cody – who have adopted Western style of functional furniture. Until next time, I’m loving life and Western style here in Cody Yellowstone.